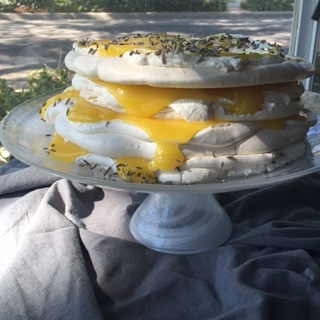 An over the top birthday cake, for an over the top friend… The Lavender Honey Lemon Meringue Cake. As you may have read, my best friend’s 40th birthday would have been last Saturday, 7/11. Her too short life, ended at 38 but I’m certain that she would have wanted those left behind to celebrate. I know her family and friends had a party back home. They ate good food and drank good drinks… It was a terribly lonely feeling to be so far away and with no other people who loved her. So, I made her a cake. I made it over the top, overly complicated and completely decadent… She would have LOVED it. I am going to walk you through this recipe but the one ingredient that will not be included are my tears. YOU must smile and enjoy yourself when you make this! She was a joyous soul and would have wanted it that way. I will affectionately refer to this cake as Tennille’s Cake, but you may call it Lavender Honey Lemon Meringue Cake. 1. Line a baking sheet with parchment paper, pour in sugar, and put baking sheet in oven, about 5 minutes. Heating sugar will help it dissolve in egg whites more quickly and create a glossy, stable mixture. 2. Make sure the bowl and whisk attachment of your stand mixer are free from grease. Pour egg whites into bowl. 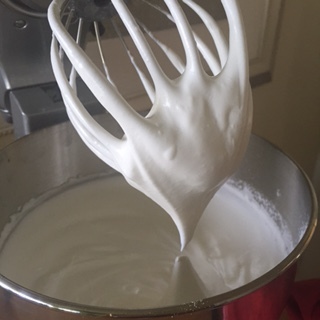 Whisk on low speed at first, allow­ing small bubbles to form, then increase speed to high and continue whisking until egg whites form stiff peaks. 3. Remove sugar from oven. 4. Whisking at high speed, add 1 big spoonful of hot sugar after another to bowl, bringing whites back to stiff peaks after each spoon. Add all sugar, except any melted edges you may have. 5. Continue to whisk on high speed 5 to 7 min­utes. Rub a bit between your fingers to feel for any grit. If gritty continue to whisk until smooth. 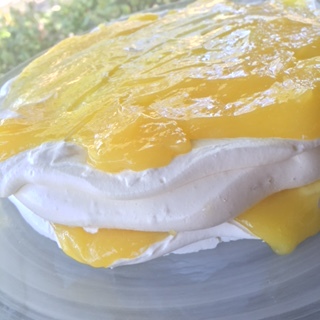 Meringue will continue to thicken during this stage. 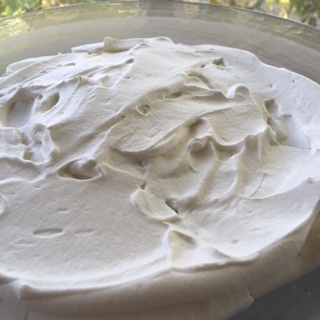 When ready, meringue should be shiny and have a stiff peak. 6. Using a large rubber spatula, spoon meringue into a piping bag or a large ziploc bag. No tip is needed. 7. Line two baking sheets with parchment and draw two identical circles between 8 & 10 inches across on each sheet. These will be your guides for the four meringue layers. 8. Pipe meringue onto the parchment using the circles as your guide. You can make these as smooth and even or as rough and rustic as you like. I prefer some lumps an waves, but as long as they are all close in size you will be fine. 9. Pop them into a 200 degree oven and set your timer for an hour. Rotate baking sheets from rack to rack half way through to ensure even cooking. 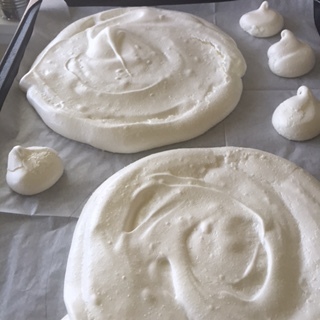 The meringue is done cooking when the disc looks dry and is easily removed from the parchment paper. If it sticks, it’s not ready. Some ovens may require 30 additional minutes, be patient. In a large saucepan, whisk together egg yolks and eggs until combined. While continuing to whisk, add remaining ingredients. Continue whisking until creamy. Cook over medium heat until custard begins to thicken. You will know when it’s done, once the custard coats the spoon. Add butter one Tbsp at a time and whisk until smooth. Strain through a mesh sieve and store in an air tight container. You can store this in the fridge for up to seven days or in the freezer for a month. Whipped cream is super duper easy. The trick is to start cold and fast. Place your bowl and whisk attachment in the freezer for at least 20 minutes prior to starting. Pour two cups cold heavy whipping cream into the cold mixing bowl and beat on high until stiff peaks form. DO NOT OVER BEAT OR YOU WILL HAVE BUTTER! Once you’ve got your peaks, add three Tbsp. honey and beat until incorporated. 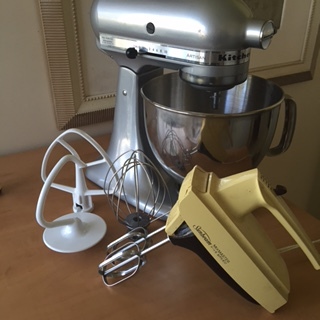 I’d like to give a shout out to my girl friend for helping me enter the modern age by giving me a wonderful KitchenAid stand mixer! I was complaining about my archaic hand mixer, by archaic I mean really freaking old. It was my mom’s and she received it as a wedding gift! Thanks for the memories, Sunbeam! I’m moving up! Thank you, Alison! Once you’ve got all of your components, begin to layer them on a footed cake plate or decorative platter. Start with a meringue disk, topped with honey whip followed by lemon curd. Repeat until all four layers are done. You likely will not use all of your curd, oh darn! You’ll have some for toast! Finish it off by sprinkling with fresh lavender blossoms. Allow to chill in the fridge for a couple hours. I traveled to a gathering with this dessert and the layers slid all around. So, unless you’ve got somebody to hold it and keep it level, I would use this recipe for at home entertaining. A positive is, the meringue really keeps a good crunch. This cake is fantastically rich, too! It fed about 15 people easily. I hope you will try this cake and make it for a special friend. Do it now, don’t delay… You never can tell if you’ll have another chance. I love you, Tennille. Previous Post Fat Tuesday: Poutine Three Ways! Next Post Gingeriffic Apple Juice!